Oversteen - The beautiful, striking office building in Business Park Hoornwijck. 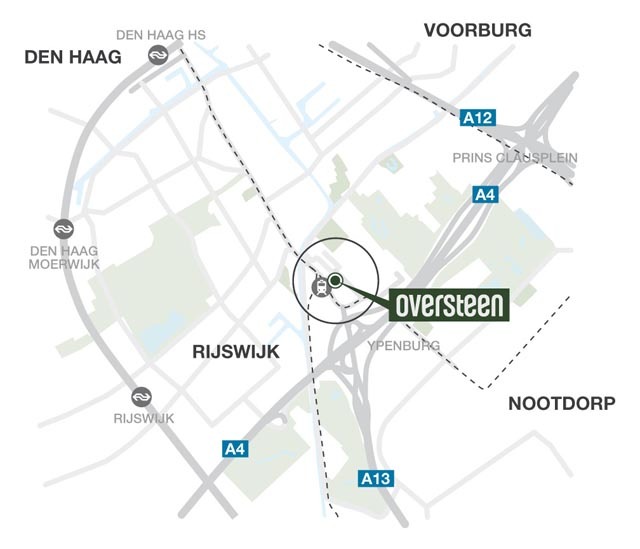 Oversteen is easily accessible by public transport. The NS station Rijswijk is close by, and the bus or tram virtually stop in front of the building. From here, you travel to the centre of Den Haag in 13 minutes, using the Binnenstad Express (Inner-city Express). Rotterdam The Hague Airport and Schiphol are easily accessible by car and public transport, and in a short time too. Not only ideal for your business trips, but for those of your foreign contacts as well. The building features a private garage which also included a cycle shed. Right next to the building there is a large public parking garage with additional capacity for visitors and also the possibility of acquisition of additional permanent parking.